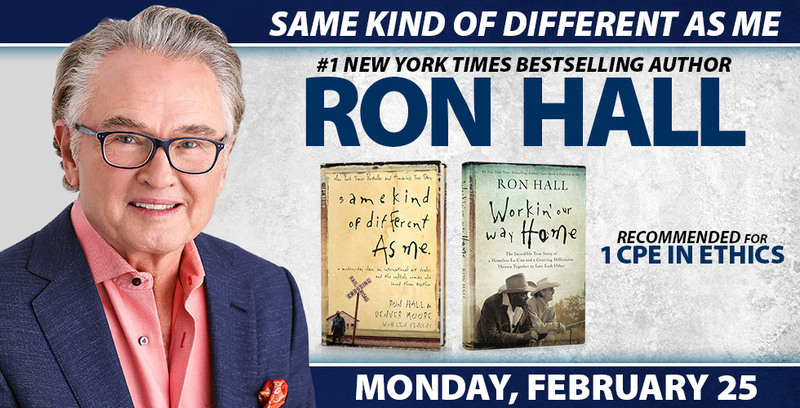 Hear Ron Hall, author of “Same Kind of Different as Me” give his personal account of his unlikely relationship as an art dealer with a homeless man who threatened to kill everyone in sight. His book was highlighted in the New York Times Bestseller list for 3-1/2 years and was later made into a movie starring Greg Kinnear and Renee Zellweger. Inspired by "regular" people who make serious mistakes, it was among the top five faith-based films in 2017. And, if you've read the book, this is your chance to learn more about the next phase in the lives of Ron and his friends as they faced life with courage, humility, honesty and commitment. It is a compelling story that fills us with hope and optimism. Currently, Ron is a screenwriter and producer of the movie version of his book SAME KIND OF DIFFERENT AS ME that was released digitally Feb. 6 2018 and on DVD/Bluray Feb. 20 2018. His new book, Working Our Way Home was released Feb. 20 2018. Missed the movie? Check out what the author and actors Greg Kinnear and Rene Zellweger have to say here. Click here for detailed sponsorship benefits. For more information on sponsorship, please click here. For table sales, please click here.